Drunk driving is a common crime in America. Every state has its own rules regarding drunk driving and it is referred to by several different names, most commonly driving under the influence (DUI) and driving while intoxicated (DWI). No matter what it is referred to as, the penalties for a DUI offense can be very serious. In 1910, New York was the first state to adopt drunk-driving laws. California followed next, and the other 48 states soon followed suit. While the early DUI laws stated simply that a driver couldn’t operate a motor vehicle while intoxicated, the lawmakers and courts hadn’t clearly defined the meaning of “inebriation” at that point. Years later, after several committees set up studies to develop tests to study “intoxication”, it was determined that a driver with a blood alcohol concentration (BAC) of 0.15 percent or higher could be presumed to be inebriated. As such, in 1938, 0.15 percent became the first commonly used legal limit for BAC. Due to groups such as Mothers Against Drunk Driving (MADD) and Students Against Drunk Driving (SADD), DUI laws and penalties began getting stricter in the 1970’s. These groups began pressuring for changes in the DUI laws. The most notable change was the increase of the legal drinking age to 21 years in all states. Zero Tolerance laws making it illegal for minors under the age of 21 to drive a vehicle with a BAC of 0.01 or 0.02 percent were also adopted. The legal limit was also affected during this time; at first it was lowered to .10 percent and then finally to 0.08 percent. Finally, laws regarding automatic license suspension after failing a breath test or refusing to take the breath test altogether were also passed. When asked to pull over, one should look for a safe place to do so and be sure to pull over carefully. The officer observes early on in the investigation ALL of the actions of a person with a potential DUI arrest. Everything that goes into the officer’s report can later on affect the outcome of a DMV hearing and trial. One should have in mind that the officer has a gun and will use it in situations where they believe self-defense is warranted; be sure to avoid making sudden and abrupt movements. There is NO obligation to submit to any of the field sobriety tests or the in-field breath device test known as the Preliminary Alcohol Screen (PAS) Breath Test. This is important to know as many law enforcement agencies use in-field breath devices as a field sobriety test and as a way to gain evidence against someone after the arrest. Keep in mind, however, that a person under 21 years of age or someone who is on probation for a prior conviction cannot elect to refuse a PAS test. While it is important to know that a person stopped does NOT have to answer any questions and that any answers given may be used against him or her in court, any communication with the officer should be courteous and polite. Hostility never works in one’s favor. A person stopped for a DUI should, however, submit to a chemical test of breath or blood (or urine if the officer believes the individual is also under the influence of drugs) in order to avoid losing their driver’s license for one year and making an already difficult situation even more complicated. Blood tests are generally more accurate than breath tests and can be made available to an attorney for independent testing, while breath test results are lost forever. One should never resist while being arrested as this could lead to the officer pressing additional and more serious charges. After being released, it is important for an individual to write down everything that he or she remembers related to the stop and arrest. Included in the notes should be the time and location of the stop, all activities that the person did prior to the stop, how much alcohol was consumed, how the officer behaved, what the officer said during the stop, which tests were conducted and how they were conducted, whether or not the officer read the Miranda Rights and what time the chemical test was administered. One should contact a DUI attorney immediately after being released in order to determine his or her legal rights and possible defenses. Does it Pay to Hire a DUI Attorney? Having an attorney deal with the criminal justice system alleviates much of the stress and confusion that comes with being charged with a DUI. Many defendants who have legal representation never have to appear in court at all. An attorney goes to court for them and takes care of all the relevant paperwork. Moreover, an attorney can make all post-conviction appearances and submit any necessary proof of program completions or progress reports. 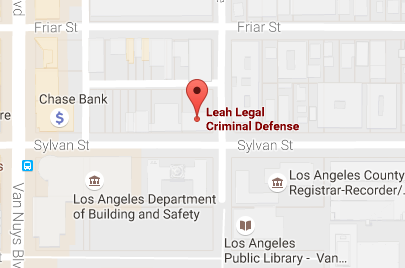 If a viable criminal defense exists in a specific case, an attorney is more likely to find it than the defendant is. There may be legal, scientific, and technical defenses available but it’s not the job of the prosecutor or judge to bring them to a defendant’s attention of their own accord. Even when no good defense to the charges exists, a lawyer can still protect a defendant’s rights and interests by making sure he or she gets the best deal possible. Judges and prosecutors will often try to seek harsher sentences in DUI cases with high BAC levels or prior convictions, and an attorney may be able to persuade them not to do so. An attorney can also help negotiate a plea bargain and get the charges – and any associated penalties – significantly reduced. The cost of getting arrested for a DUI could be a mere couple of dollars for a 12 pack of beer or several glasses of wine at dinner. But the cost of dealing with a DUI arrest and its aftermath can be astronomical. The following is an approximate breakdown of the costs that one will likely encounter after being arrested for a DUI. The costs go up when there are prior DUI offenses, when there is an accident involved and someone gets hurt, or when there is damage to property. Keep in mind; fines will differ from county to county. Bail – The most common bail amounts on a bond-required DUI are from $5000 to $15,000, which makes the cost anywhere from $500 to $1500. Towing/Impound – Unless a passenger drives the vehicle away from the scene of the arrest, the car will be towed and impounded. The costs of towing and storage can reach $500 and more and gets even higher the longer the vehicle is in storage. Increase of Insurance Premium – A driver’s insurance premium will increase following an arrest for DUI, regardless of whether or not there is a conviction. Most insurance companies will raise rates at least $1000 – $2200 per year. The increased insurance will last for three years and may take several more years until preferred driver status is returned. This equates to about $3,000 – $6600 over the 3 year period. Court Fees and Fines – When a driver is convicted of DUI, he or she faces court-imposed fines. Since these fines are usually at the court’s discretion they can vary. First time DUI fees in California typically range from $390 to $1,000, but convicted drivers can generally count on an additional penalty assessment fee that will amount to three times that number. If paying these large amounts of money is too difficult, the judge will sometimes allow Cal Trans, Community Service, or jail time in lieu of the fine. Attorney Fees – The costs of retaining an attorney depends largely on the qualifications of the attorney, the details of the case and the location of the arrest. An experienced DUI attorney will charge anywhere from $3,500 to $8,000 depending on the location, whether or not it is a first time offense, whether or not it is a felony or misdemeanor, how complicated the case is and how long it will take to resolve. If the case goes to trial, there is an extra $5,000 at minimum. Additionally, there can be other expenses such as the service of subpoenas, expert witnesses and independent blood analysis that could hike the cost up even higher. Accident Fees – If someone is involved in an accident, he or she may have to pay for the damage caused. They should also be prepared to pay for an ambulance, police or fireman services if any of these emergency services are called to the scene of the accident. Further, they will face having to make restitution payments to the victim and to the LAPD or the CHP for their time. DMV Re-issuance Fee – The administrative cost for getting a license reissued after it has been suspended is $125. Alcohol or Substance Abuse Classes/Counseling – These costs can be $500 or more depending on whether or not it is a 3, 6, 9 or 18-month program. Ignition Interlock Device – If installation of an ignition interlock device (IID) is required, there is usually an installation fee of about $100 and then a monthly rental fee, which ranges from $50 – $100 per month. In total, the price of a DUI could end up anywhere between $9,115 – $18,825. This is 90x to 190x more expensive than hailing a $100 taxi ride home. Economic Cost of a DUI – The costs of alcohol impaired driving affect more people than just the driver or even the victim. It affects the entire nation’s population in more and bigger ways than you might have expected. Alcohol is a factor in a whopping 26% of the United States’ crash costs. Alcohol-related crashes in the United States cost the public an estimated $114.3 billion in 2000, including $51.1 billion in monetary costs and an estimated $63.2 billion in quality of life losses. Alcohol-related crashes are deadlier and more serious than other crashes. People other than the drinking driver paid $71.6 billion of the alcohol-related crash bill. Alcohol-involved crashes resulted in 16,792 fatalities, 513,000 nonfatal injuries, and $50.9 billion in economic costs in 2000, accounting for 22 % of all crash costs. Costs for crashes involving a driver or non-occupant with a blood alcohol content of .10 % or greater (the legal definition in most states), accounted for 75 % of the total of all alcohol-involved crash costs. The impact of alcohol involvement increases with injury severity. Alcohol-involved crashes accounted for 10 % of property damage only (PDO) crash costs, 21 % of nonfatal injury crash costs; and 46 % of fatal injury crash costs. Crashes in which alcohol was the cause resulted in 13,570 fatalities, over 360,000 nonfatal injuries, and nearly $40 billion in economic costs. This is approximately 80 % of the alcohol-related fatalities and 78 % of costs. It represents 32 % of all fatalities and 17 % of all costs from motor vehicle crashes. Costs per Drink: The societal costs of alcohol-related crashes in the United States averaged $1.00 per drink consumed. People other than the drinking driver paid $0.60 per drink. Impact on Auto Insurance Rates: Alcohol-related crashes accounted for an estimated 18% of the $103 billion in U.S. auto insurance payments. Reducing alcohol-related crashes by 10% would save $1.8 billion in claims payments and loss adjustment expenses. Probable Cause – The officer needs to provide “specific articulable facts” that indicate there was reasonable suspicion to pull someone over. If there was no evident reason to stop, detain, or arrest someone, there is no probable cause for the arrest. If this is the case, other evidence of DUI will be overlooked and it is very likely that the case will be dismissed. 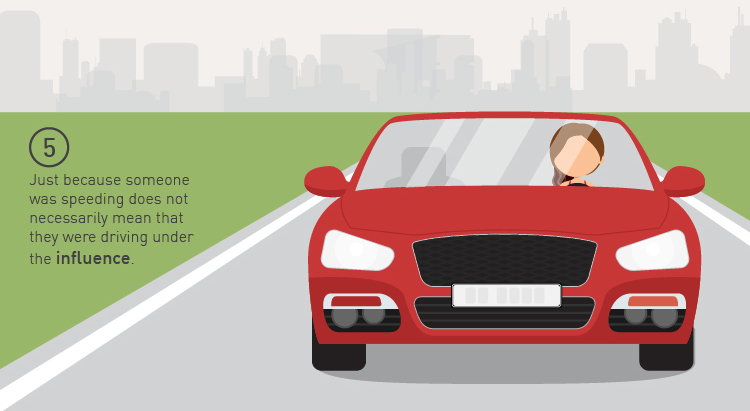 Bad Driver – Just because someone was speeding does not necessarily mean that they were driving under the influence. It is a well-known fact that sober drivers commit the majority of traffic violations. If someone weaves between lanes or speeds, the officer may try to use this as evidence that they were driving under the influence. This claim is not based on hard facts. Was the Person Driving? – The prosecution must prove that an individual was actually driving. A person cannot be convicted of a DUI if he or she wasn’t driving the vehicle at the time of the alleged offense. If, for example, someone was parked in a parking lot before being approached by a police officer and the officer didn’t actually witness them driving, the officer may have a hard time proving that he or she was driving impaired. Miranda Rights – An officer must advise the arrestee of their Miranda Rights if they are in custody or if they are questioned in order to gain possible incriminating information. If Miranda Rights are not read, anything that the person said will most likely be excluded from evidence. Innocent Explanation for Symptoms – Police officers will often use their observations as hard evidence to prove that someone was driving under the influence. “Objective symptoms of intoxication” include but are not limited to slurred speech, bloodshot or watery eyes, unsteady hands, or being red in the face. An officer has a list of these symptoms on his report that he simply checks off. However, there can be a number of other innocent reasons why these symptoms are present other than intoxication. Implied Consent Warnings – It is unlawful for an officer to fail to inform someone of the ramifications of denying a chemical test. Title 17 Regulations – California Code of Regulations Title 17 sets forth procedures that need to be followed by whoever is administering the tests. If these regulations are not followed, the results from the test may be excluded from evidence. For example: A police officer must examine a person for fifteen minutes prior to administering a Breathalyzer test; failure to carry out an observation period could be a defense. Breath Testing Machines – There are many factors that can affect the results of breath tests, and common breath testing machines are known to be unreliable. Increase in Blood Alcohol Level – An attorney can make the argument that the blood alcohol concentration in an individual’s system was below the legal limit while driving, but had increased during the stop and the administration of the test. This defense can only work when the person consumed alcohol very close in time to his or her driving as this would mean that the alcohol didn’t have enough time to get completely absorbed into the bloodstream. First DUI Conviction – If the court grants summary probation, the defendant will either receive a 48-hour to 6-month jail sentence and a 6-month driver’s license suspension, or a 90-day restriction on the driver’s license that allows driving for work and treatment program only. Additionally, the court will order the defendant to complete a 3-month alcohol or drug program (longer if the BAC is .20 or above) and will impose a base fine of $390 to $1,000. If probation is not granted, the court may sentence 96-hours to 6-months in jail, a $390 to $1,000 base fine and a 6-month driver’s license suspension. Second DUI Conviction – With a probation sentence, the defendant will either receive 10-days – 1-year in jail and a 2-year driver’s license suspension, or 96-hours to 1-year in jail, an 18-month program and restricted driver’s license allowing driving only for work and program duration. Additionally, both options carry a base fine of $390 to $1,000. If probation is not granted, the court may sentence 90-days to 1-year in jail, $390 to $1,000 base fine, and a license suspension for 2 years. Third DUI Conviction – With a probation sentence, the defendant will receive 120-days to 1-year in jail, a base fine of $390 to $1,000, a 3-year license revocation, and an 18-month alcohol or drug program if one was not done before. If probation is not granted, the court may sentence120-days to 1-year in jail, $390 to $1,000 base fine, and a 3-year license revocation. Fourth or Subsequent DUI Conviction – With a probation sentence, the defendant will receive 180-days to 1-year in jail, a base fine ranging from $390 to $1,000, a 4-year license revocation, and an 18-month program if one has not been done before. Enhancements – If enhancements are added to the sentence, the penalties will be greater and the fines will increase. Enhancements include prior, having a minor child in the vehicle at the time of the arrest, and driving in excess speed. In addition, anyone under the age of 21 convicted of a DUI will have different and often more stringent penalties. Most people understand that there are immediate effects of a DUI conviction – suspended license, fines, jail time, alcohol and/or drug classes, IID and probation. Many, however, do not consider that there may be long-term consequences to getting a DUI. One of them is the effect that a DUI conviction could have on their employment. Being convicted of driving under the influence in California can be very detrimental to an individual’s employment prospects, yet, if handled properly, is not usually a hopeless situation. DUI’s are very commonly prosecuted in California; hundreds of thousands of DUI arrests are made annually and thus there are many people with DUI convictions on their records. For the most part, and particularly for those who have firmly established careers, life continues as usual. Some people who plead to drunk driving charges, like George W. Bush, even go on to become the President of the United States. An exception to this would be when the job actually involves driving; oftentimes an employer will choose to terminate the employment due to a tarnished driving record. Other exceptions include those who may hold some type of license for a certain profession (i.e. lawyer, nurse, plumber, etc.). In that case, the agency that maintains the license could require the individual to report any criminal arrests or convictions, including DUI’s. Some agencies will allow the person to keep their license, but might revoke or suspend the license upon failure to report the DUI arrest or conviction. It would be wise for a license holder dealing with a DUI conviction to contact that particular agency to be sure about the reporting requirements. For those who are in between jobs, a DUI conviction is more likely to have an impact on future employment. Generally speaking, when employers receive job applications with drunk driving convictions, they tend to put those applications on the bottom of the pile even though there may not even be strict policies regarding drunk driving convictions in place. 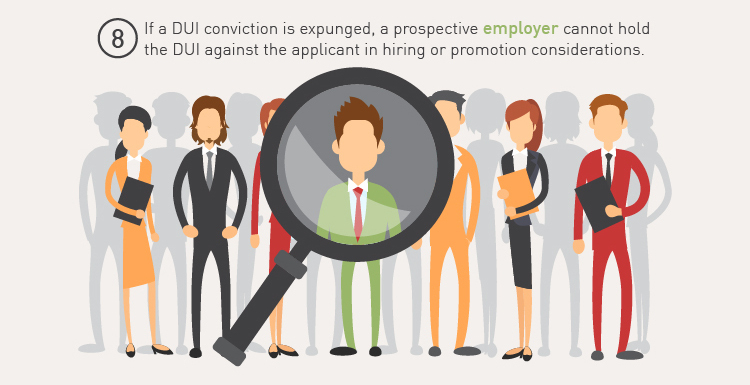 Since employers are usually legally entitled to make inquiries with regard to misdemeanor and felony convictions, they will typically order background checks from law enforcement agencies and from third-party data brokers to see if applicants have been arrested for DUI offenses. However, they are rarely allowed to inquire about arrests that did not end up in a judgment of guilt. It is crucial that one with a DUI conviction applying for a job be honest about it when filling out the application. At the same time it is just as key that he or she act with self-assurance when the issue comes up during the interview. If the prospective employee feels, acts and speaks with confidence about the incident, then the employer, in turn, will be put at ease with regards to the DUI incident. When a conviction is not disclosed right away and then it shows up on the background check, it may look like the applicant is being untruthful or hiding something. This could lead to the employer’s questioning the integrity of the applicant. Or, in the event that the employer finds out about the DUI after the hiring, it is likely that the employment will be immediately terminated. When the DUI conviction is the only negative item in the background check, it is a good idea for the applicant to explain that it was an isolated situation and to admit that it was a bad choice that was made after an event. If it is the truth, the applicant should state that he or she has never driven drunk since the incident and that the mistake ultimately helped change his or her life for the better. Since having a DUI conviction is so commonplace these days, most prospective employers aren’t that shocked when an applicant confesses to a DUI. Sometimes, when a DUI appears on the application, the interviewer won’t even bring it up. If that happens, it isn’t necessary for the applicant to bring up the issue on his or her own. Unfortunately, many occupations that involve professional or state licensing or certification may disqualify a potential job applicant who has a DUI conviction. Occupations that include state licensing or certifications include drivers, teachers, doctors and attorneys. In addition, some jobs need security clearance and individuals with a record may not be eligible for a security clearance. An expungement is a court-ordered process, which effectively “seals” a record of a criminal conviction. An expungement of a DUI in California basically functions the same way as an expungement of any other criminal record. There is a petition that is filed with the court and reviewed by the judge. If and when the judge grants the DUI expungement, the plea of guilty or no contest is withdrawn, a new plea of not guilty is entered, and the case is dismissed. The charge or conviction is not completely erased, per se, but is sealed for most purposes, including most employment-related background checks. The criteria for an expungement of a DUI in California are that the individual must be placed on probation and probation must be completed successfully. After being convicted of or pleading guilty to a DUI, a person is usually placed on several years of probation (typically between three and five years). While some people will petition the court the terminate probation early, the reality is that most judges are reluctant to do so in a DUI case. Judges generally want to see that the individual is able to drive without any measurable amount of alcohol in his system for as long as possible. Be aware though, that while the expungement effects a person’s obligation to disclose the DUI conviction for employment purposes, the conviction is still priorable in California when it comes to a repeat offense. This means that if someone were to get another DUI within ten years, both the court and Department of Motor Vehicles (DMV) will consider it a repeat offense – regardless of the expungement. Also, even an expunged DUI must not be omitted on any application for professional and government employment and licensing, security clearance and bonding. The employer and the licensing agency can then decide whether the applicant is banned from employment, licensing or both because of the conviction. Each college or university has its own policies to determine the effect of a DUI arrest or DUI conviction after someone has already been admitted. Some require that any arrests be reported to the administration within a certain time period, and the actual failure to report results in suspension. Multiple DUI’s may lead to temporary or permanent suspension. In addition to a college’s policies, certain governmental licensing agencies can influence whether or not a college will allow admission if that degree program requires certain types of licenses. Examples include nursing or law licenses; the state agencies that issue these licenses may not issue the licenses to applicants with a DUI felony conviction or numerous misdemeanor DUI convictions. Consequently, if the university is aware that an applicant doesn’t qualify for a license, they may refuse entrance into the program. It is always a good idea to check with the particular licensing agency to see if a DUI arrest or DUI conviction will affect an application. Although DUI occurrences have decreased somewhat over the past several years due to the efforts of advocacy groups such as Mothers Against Drunk Driving (MADD), the percentage of incidents of DUI in California is still very high. Recent DMV statistics show that there were over 180,000 DUI arrests in 2011 in Southern California alone. A driver cannot drive with a BAC of .08 or above. Drivers under 21 years of age cannot driver with a BAC of .01 or above. Drivers under 18 years of age cannot drive with ANY measurable BAC. Drivers who hold a commercial driver’s license cannot drive with a BAC of .04 or above. Drivers who are repeat offenders cannot drive with a BAC of .01 or above. Drivers under 21 years of age cannot carry unsealed beer, wine or liquor in their vehicle while driving alone. Drivers under 21 years of age cannot consume alcohol in any form, including cough syrup and prescription drugs. Driving under the influence with a child in the car will likely result in an additional charge of child endangerment, which carries an increased penalty. It is illegal to ride a bicycle or operate a boat while under the influence of alcohol or drugs. It is illegal to have an open container of alcohol in a vehicle, even if it was not consumed. If you plan to go out and party, be sure that before you leave you tell a friend where your are going and approximately when you’ll be back. It is highly advisable that you drink with friends who are sober. Don’t drink too quickly and try to pace yourself with your drinks. Avoid drinking hard liquor whenever possible. Leave the party if the party gets out of hand. Don’t leave a drink alone or with someone you don’t know, and don’t take drinks or anything else from strangers. Work out a system of having designated drivers; never ride with drunk or drugged drivers. Don’t offer rides to people you don’t know. If you do get arrested for a DUI, contact an experienced DUI attorney immediately.